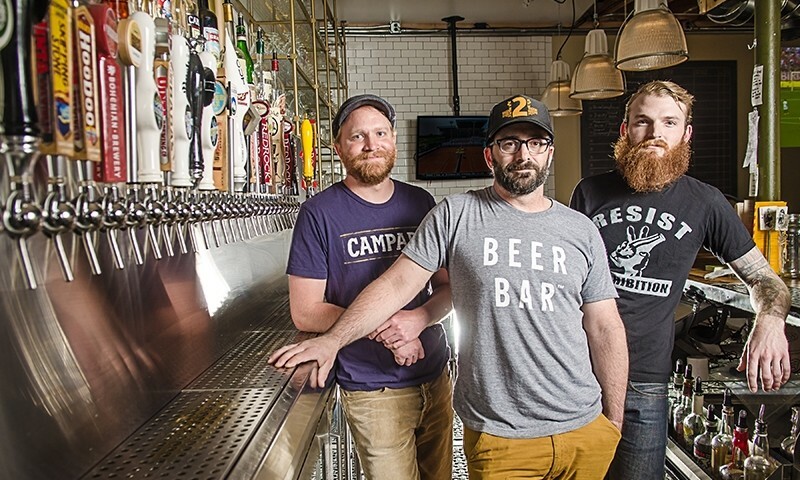 (L–R) Beer Bar owners Rich Noel and Duncan Burrell, and Certified Cicerone® Kyle Trammel have streamlined Beer Bar’s purveyance of quality beer. Simple, clean, satisfying beer has four primary ingredients—yet, the flavor combinations and styles are plentiful. Those who truly appreciate the crisp bite of an IPA or the cool, refreshing quality of a lager can go on forever about things like the palate and bouquet of their favorite fermented beverages. However, it takes a special kind of person to bring that information to the masses and create a unique experience for the consumer. Salt Lake City’s Beer Bar is a place where a like-minded group of beer aficionados have come together to provide just such an experience. 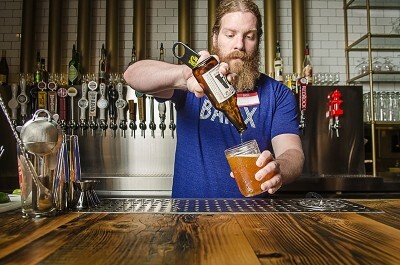 Located in the up-and-coming 2nd and 2nd district of downtown SLC, Beer Bar opened in April of this year as an extension of the famed Bar X, a place where people have been enjoying artisan cocktails carefully crafted by some of the finest bartenders this side of the Sierra Nevada. When the ownership decided to green light their beer garden idea, they knew there was one man who could help them achieve their vision and make it a success. Early last fall, Kyle Trammell (former SLUG beer reviewer/columnist and current SLUG affiliate) received word that Beer Bar was a go and that he was needed to serve as a beer consultant to get the place up and running. He had been deep in the bush of Australia, working to set up a 60-barrel brew house for a new brewery in New South Wales. Trammell knew the idea had been in the works for a while, and he was excited to come back to Utah and assist in making it a reality. Trammell is no stranger to beer. He has worked in the industry for several years, and has a profound knowledge of what goes into creating, serving and enjoying a wide variety of beer. His various stints at breweries like Bohemian and Red Rock enabled him to develop his lust for beer under the tutelage of people like Kevin Templin. He also spent time at the Beer Nut, peddling home-brew supplies to the public. His passion for brewing his own beer is evident when he talks about the intricacies of crafting the malty beverages. It is this passion that led him to gain a Certified Cicerone® accreditation and become a legitimate beer connoisseur via the recently founded Cicerone Training Program, founded in North America. Certified Beer Server Jaren Skinner prepares a Lagunitas IPA. According to cicerone.org, the term comes from an English word referring to “one who conducts visitors and sightseers to museums and explains matters of archaeological, antiquarian, historic or artistic interest.” I argue that beer is art, and it certainly has quite the historical background, so the name seems to fit. According to Trammell, the first step to becoming “an expert in all things beer” requires a bit of study and a formalized testing process. By proving one’s general knowledge and passing the test, one can become a Certified Beer Server (CBS). These individuals are well-suited for working at a bar or restaurant and delivering an authentic beer experience to the patrons. Each bartender at Beer Bar possesses a CBS and is expected to uphold its standards when maintaining, presenting and pouring beer. The next step in the program is becoming a Certified Cicerone®. This process is much more intricate and requires extra attention to detail. Trammell has spent his adult life learning about beer, and this certification was the logical continuation of his career. His enthusiasm for beer comes through in a schoolboy type of excitement, and it is no wonder he completed the program in short order. Obtaining the rank of Certified Cicerone® requires a rigorous study process followed by an in-depth 150-question test on everything from tap-system maintenance to food pairings. Then, each candidate must go through a taste test where they have to identify two beer styles, their alcohol content, and even tell what may be wrong with the way it was brewed or served. The two-day endeavor takes place around the country at various breweries—Trammell took his at Stone Brewing in California. Currently, there are about 600 Certified Cicerones® worldwide. Trammel is also pursuing his Master Cicerone®, for which he will test next May. “The fail rate for this test is through the roof. There are only eight Masters worldwide, so I am going to need to hit the books pretty hard,” says Trammell. The Cicerone training has given Trammell a strong foundation to build upon as he continues working in the industry. His partnership with Beer Bar owners Duncan and Ty Burrell, Rich Noel, Dave Hunt and Jeff Barnard has grown out of mutual respect and a profound love of beer. 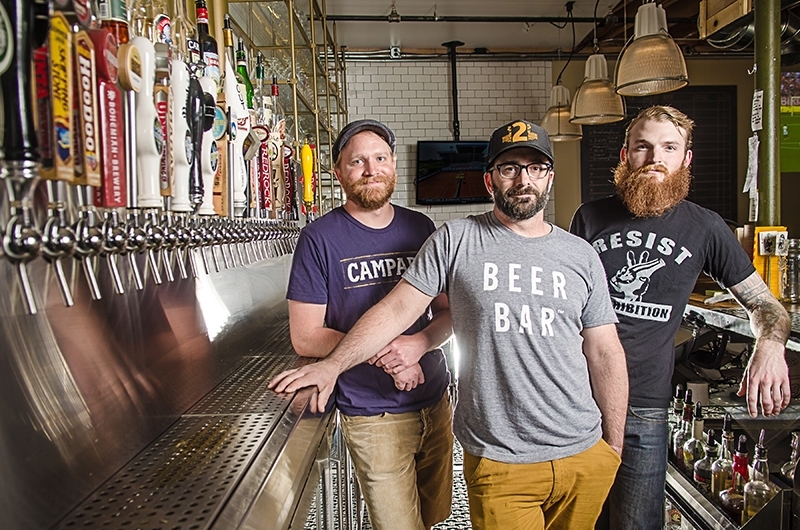 “The concept was to be as simple and beer-focused as possible,” says Duncan. They had originally wanted to do something like Beer Bar when they took over Bar X, “but it just made more sense, at the time, to focus on cocktails. The (Bar X) space sort of made that decision for us—it’s more suited for cocktails,” Duncan adds. The timing for Beer Bar’s opening was more or less happenstance, and they celebrated with a soft opening in March and a grand opening in April.